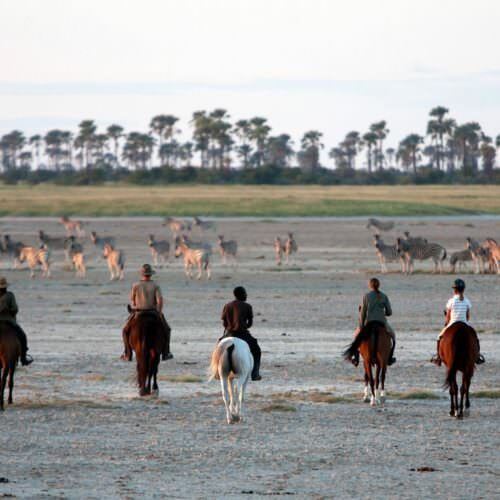 The Kalahari Safari takes you into the Makgadikgadi salt pans, an ancient lake that dried up around 1500 years ago. 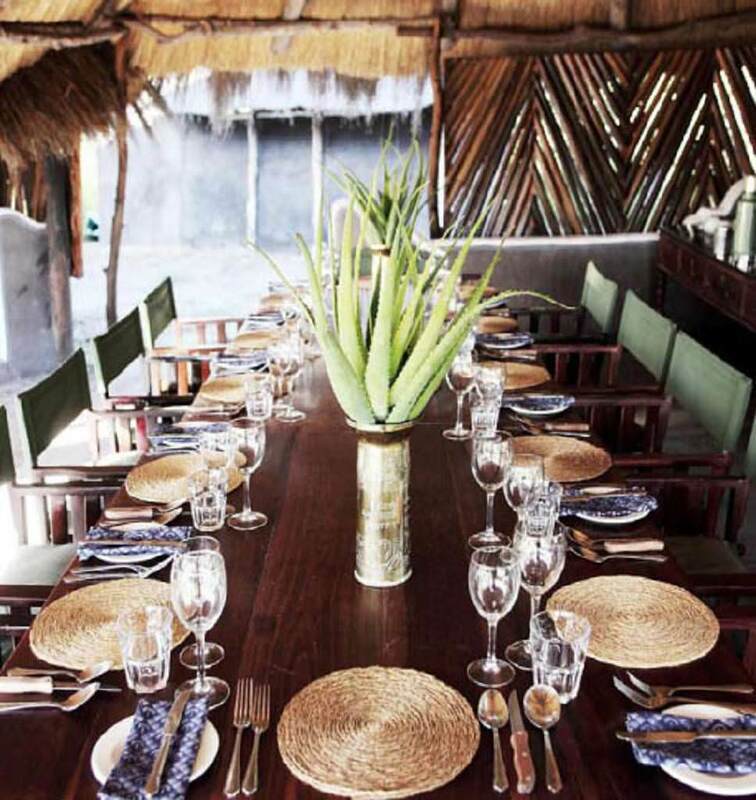 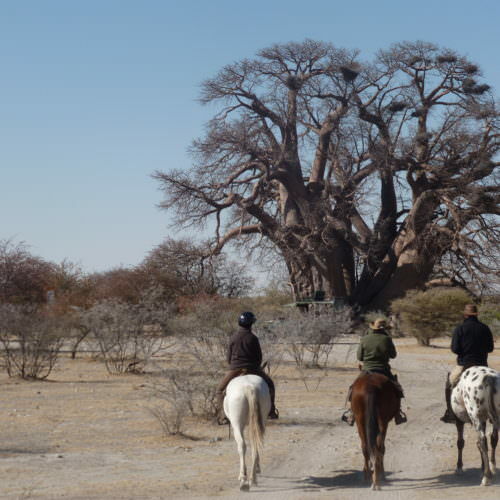 The salt-encrusted pans are dotted with giant baobab trees and separated by palm covered sandy islands; the landscape is flat. 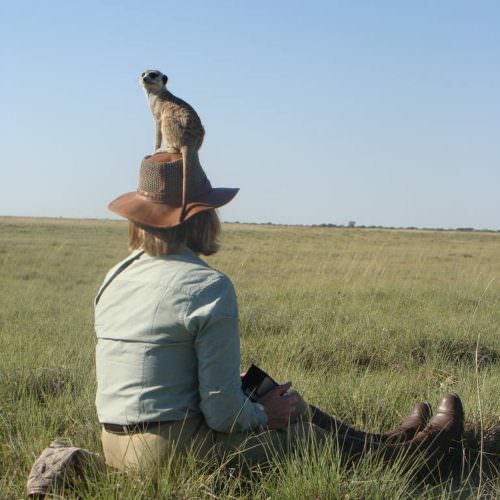 The Pans offer some unique highlights – the chance to look for the shy brown hyena; to interact with meerkat families and take walks with indigenous bushmen, learning about how they survive in this harsh environment. 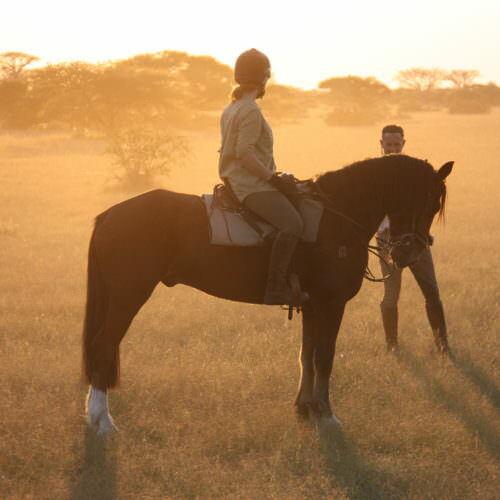 Since you are riding in an area of potentially dangerous game, you need to be a confident intermediate rider. 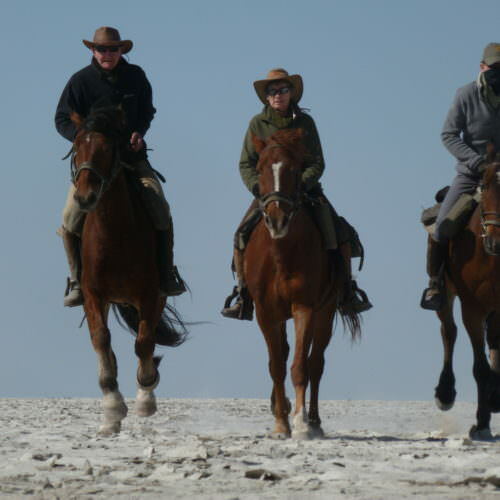 It is important to be comfortable and secure in the saddle at all paces and to be able to stay on your horse should you need to react quickly. 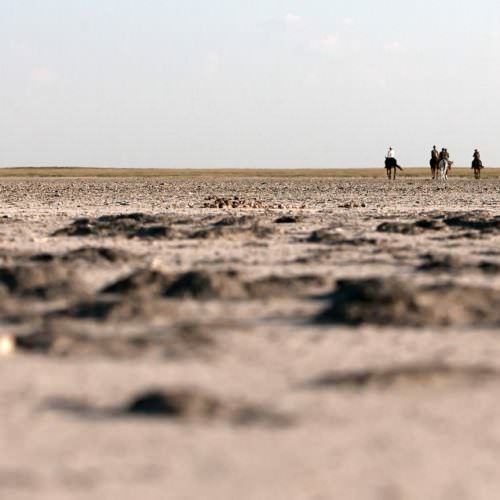 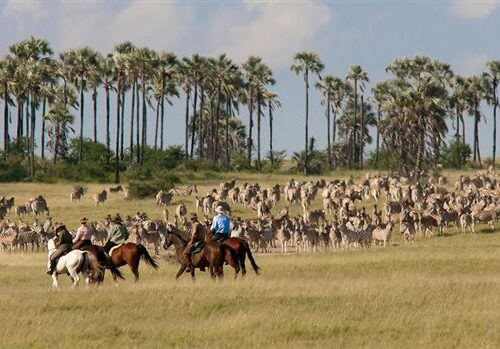 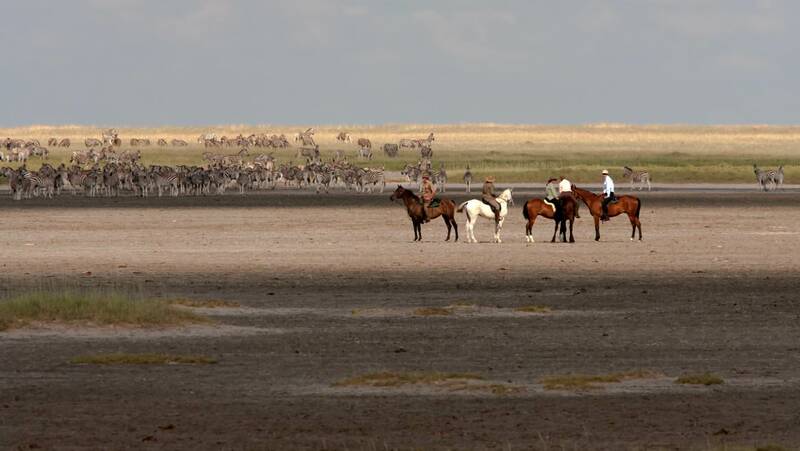 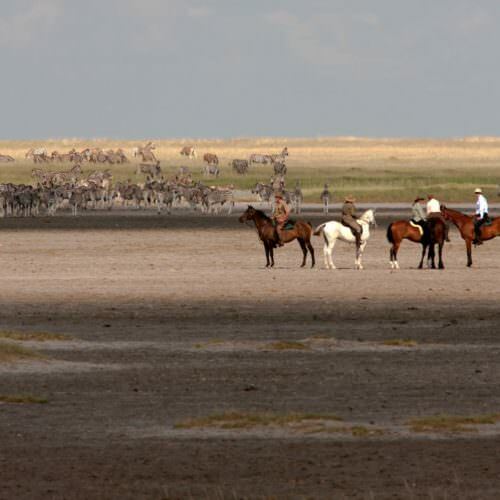 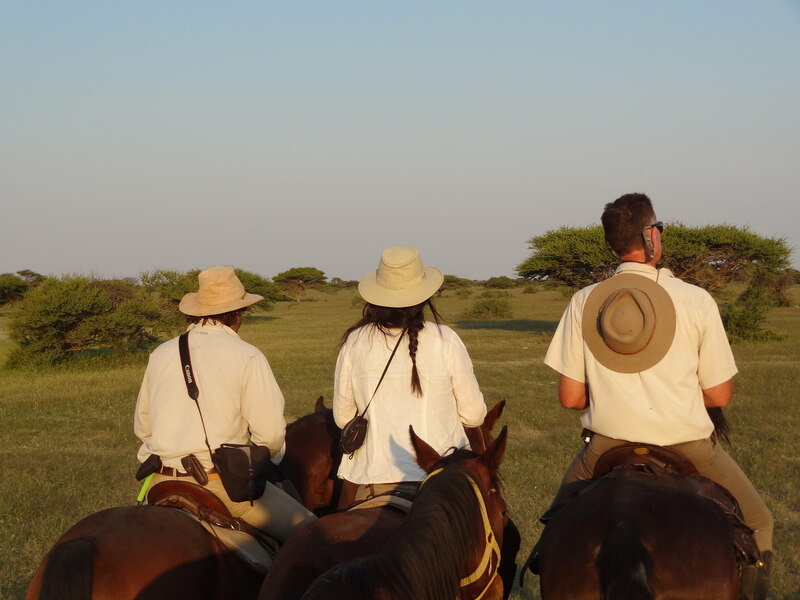 The pace is moderate to fast - walking for game viewing with possible full gallops and longer canters on the salt pans. 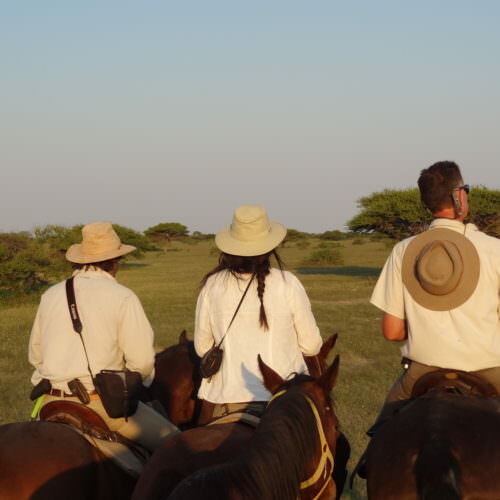 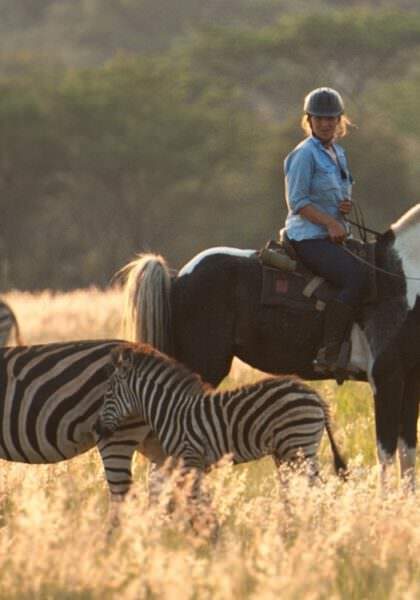 The horses used on the safari are Boerperd and Thoroughbred crosses but also include Appaloosas and local bush horses. 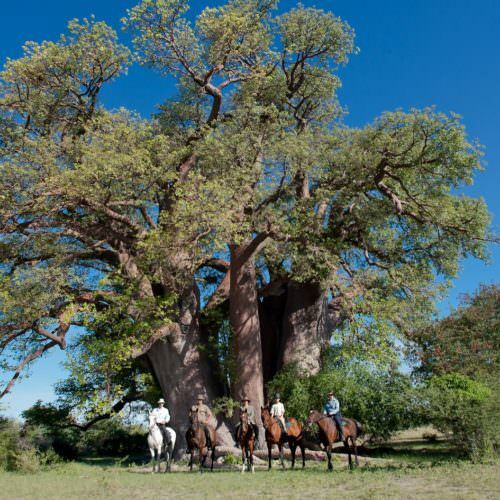 They range in height from 14.3hh to 16hh are in excellent condition and fit for their work. 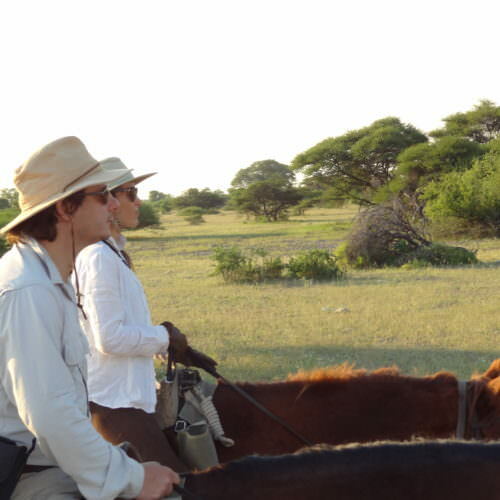 Saddles are mainly South African trail saddles or McClellan type. 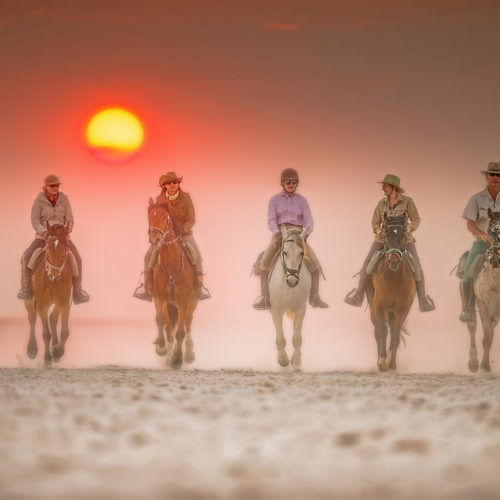 Horses are tacked-up for you but you should be prepared to assist with unsaddling and watering your horse at the end of each day's ride. 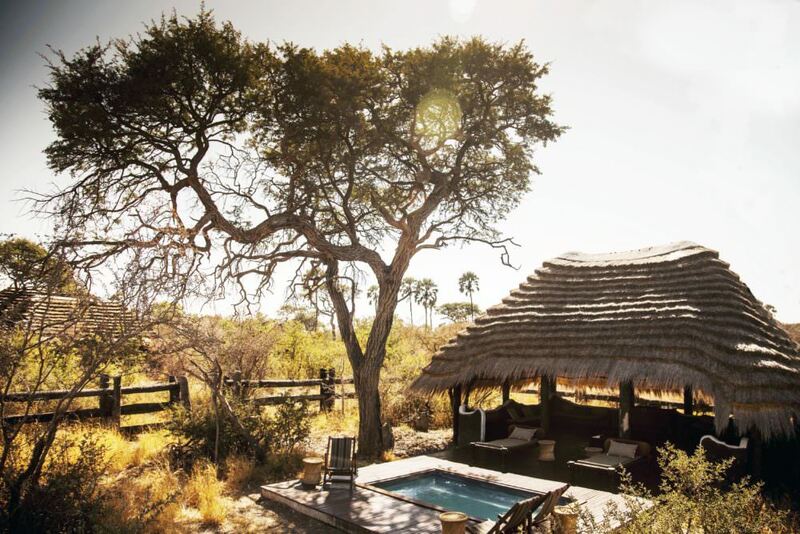 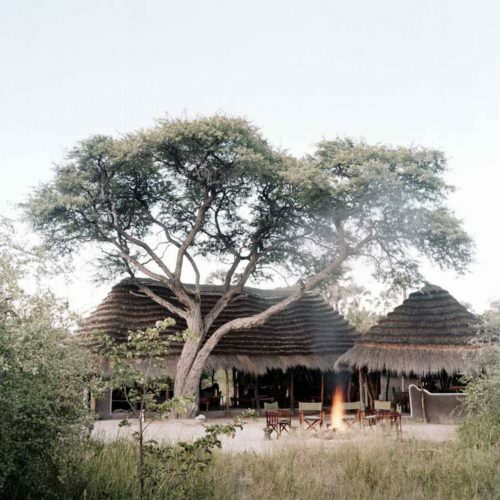 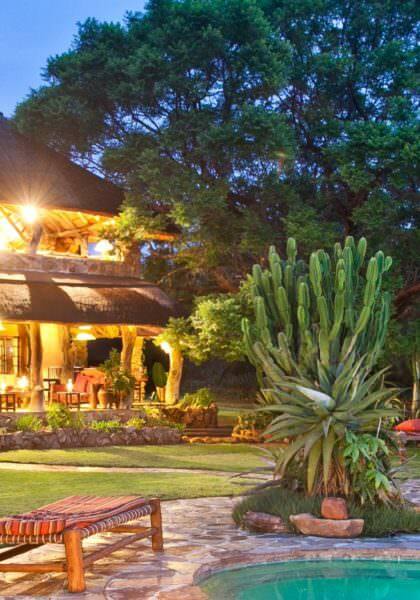 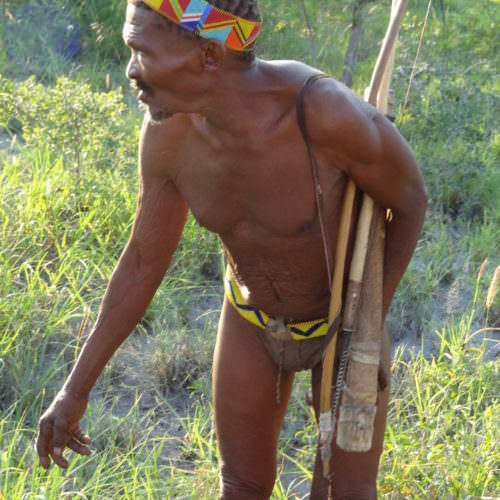 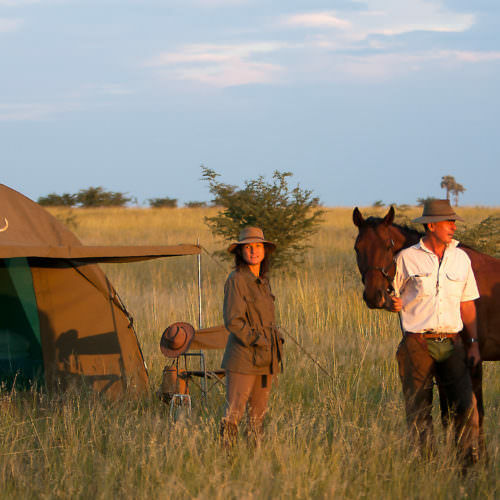 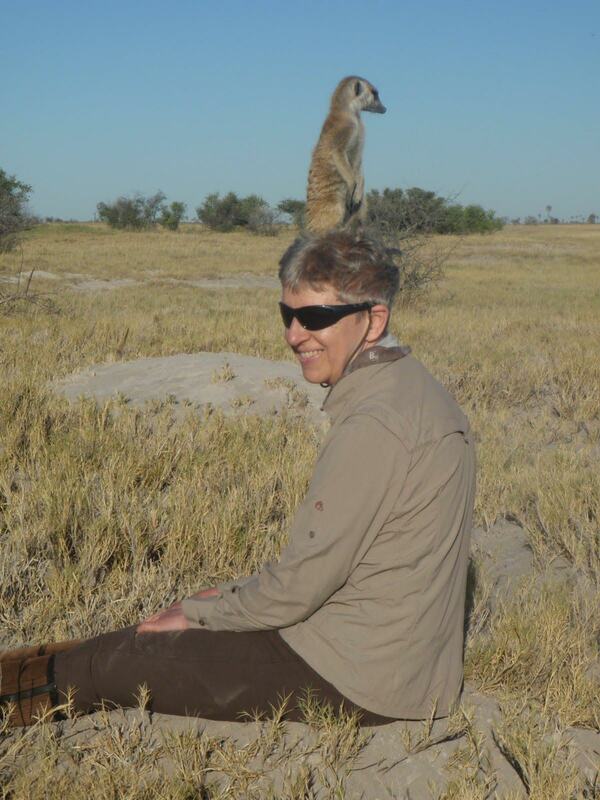 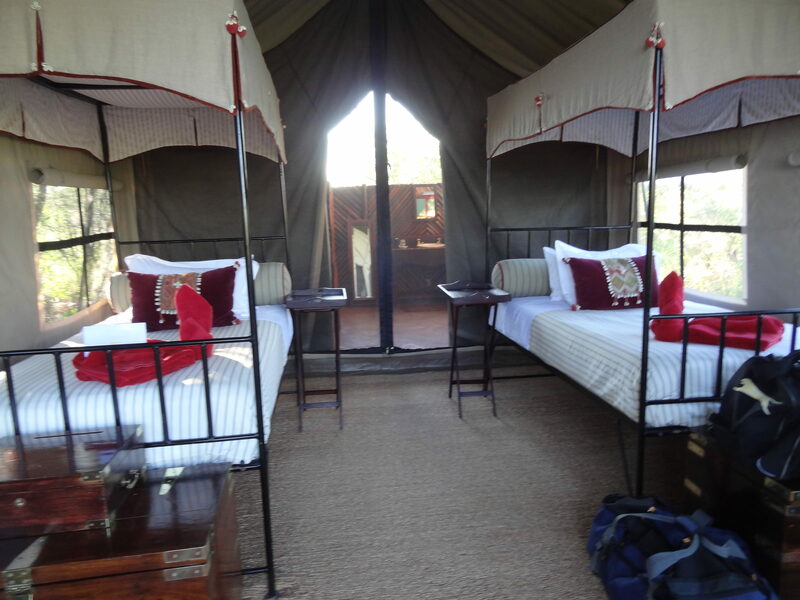 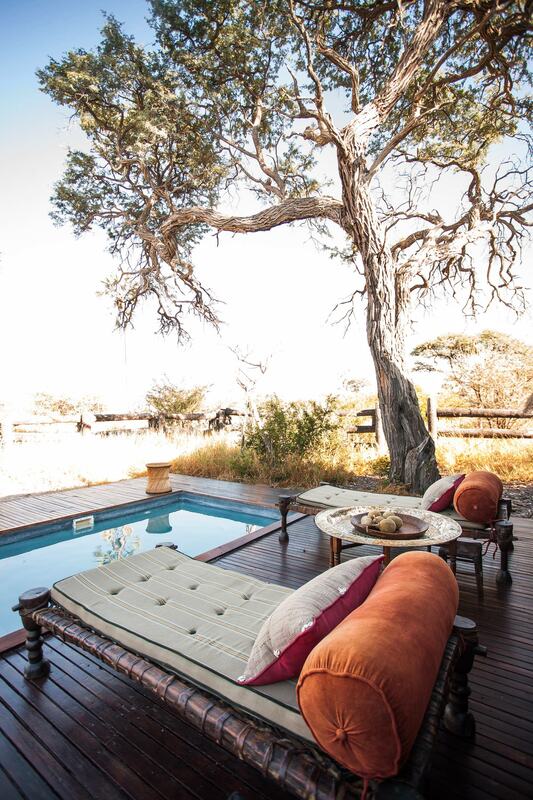 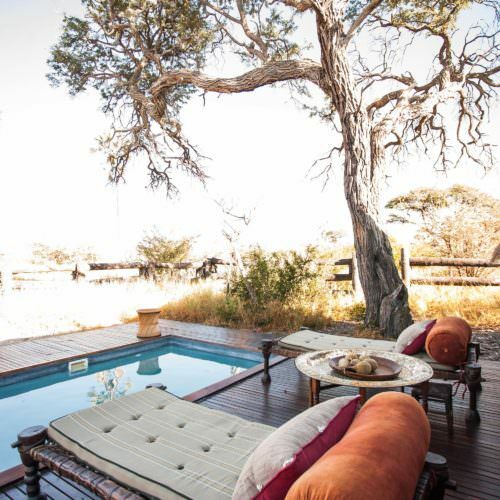 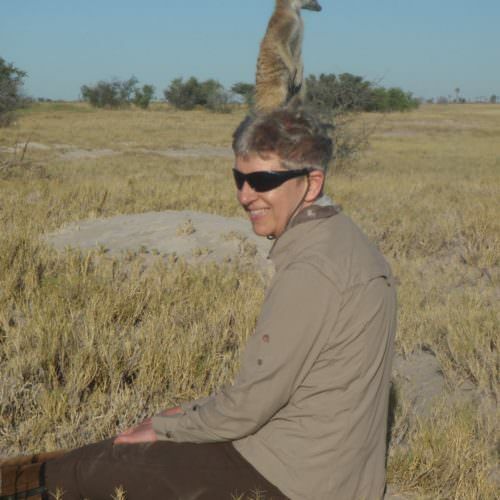 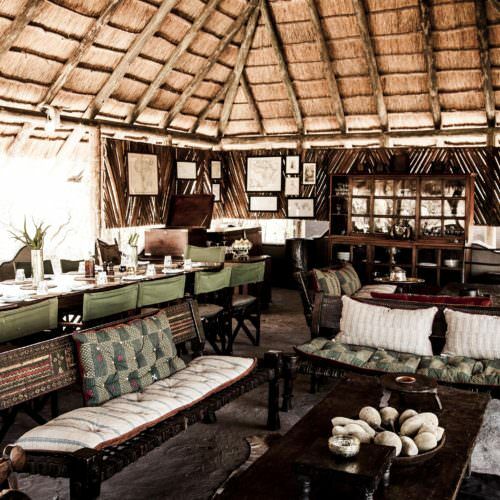 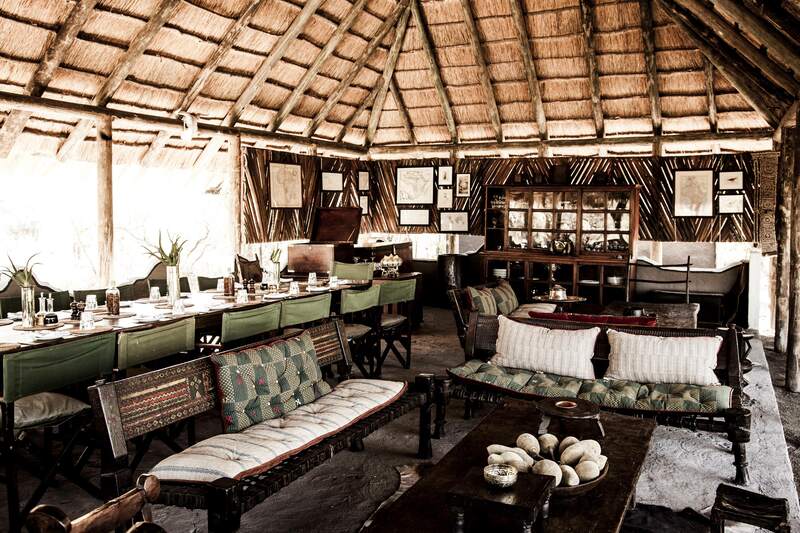 During a five night safari you stay three nights at Camp Kalahari and two nights at a fly camp. 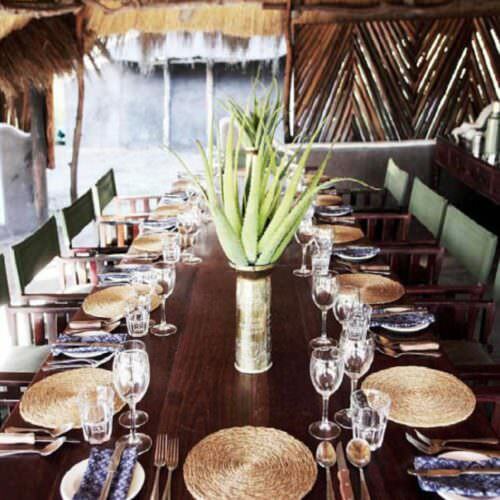 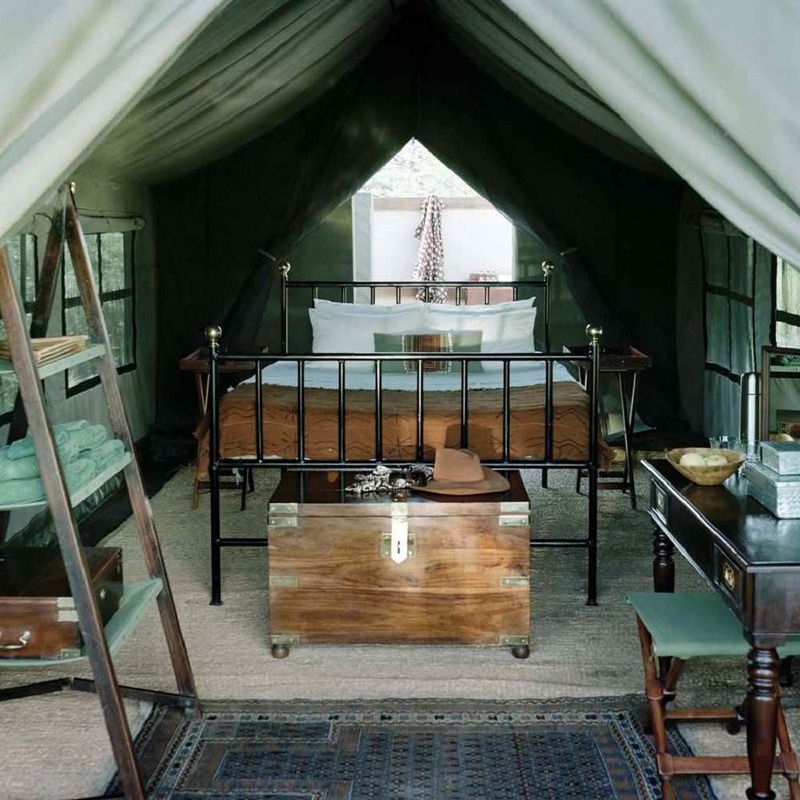 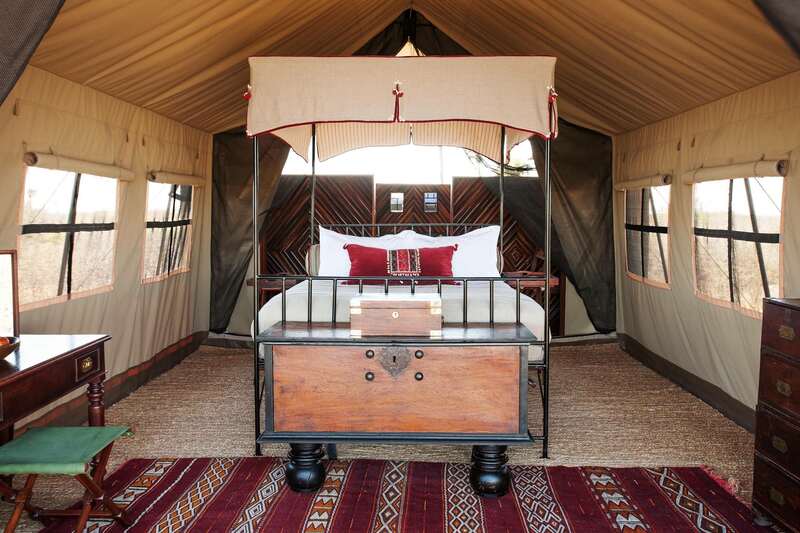 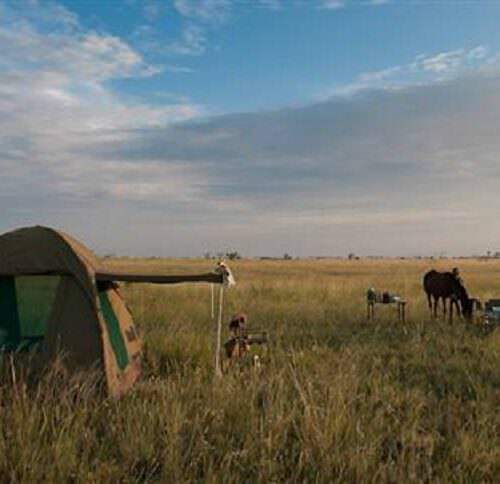 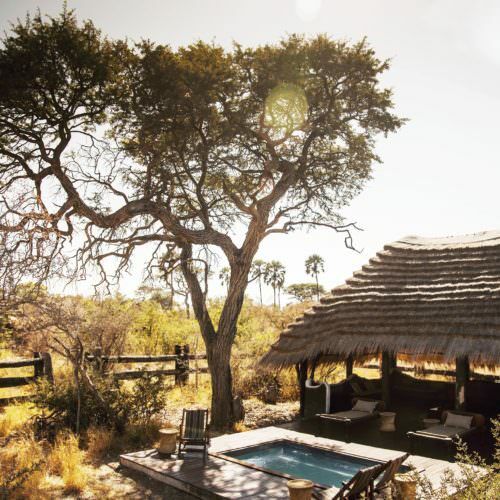 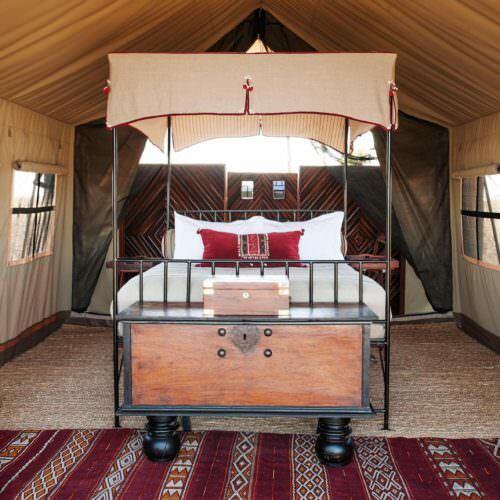 Camp Kalahari offers permanent 'A' framed tents with en-suite bathrooms, whilst fly camp is more rustic with simpler dome tents and bucket showers. 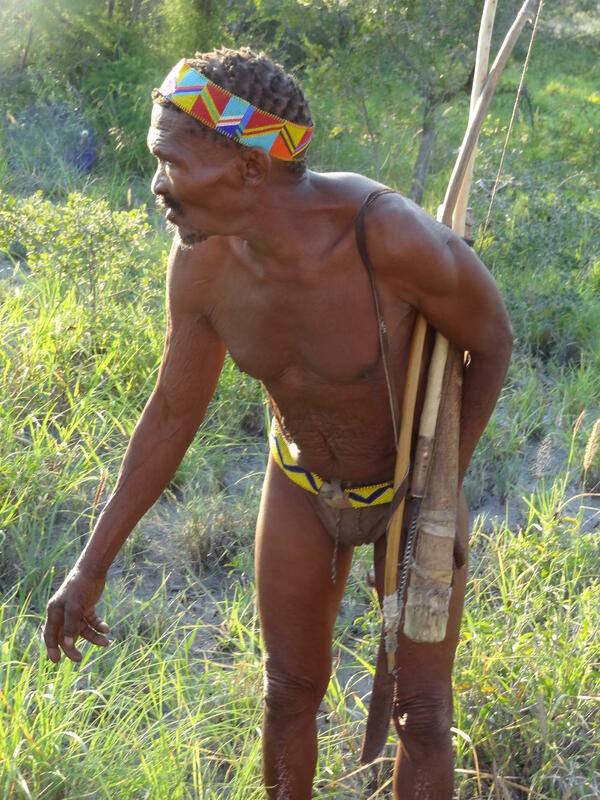 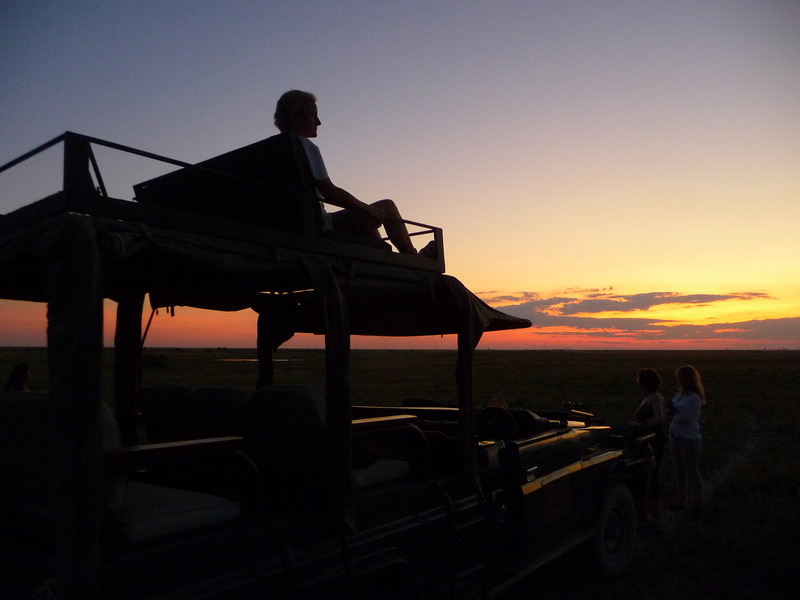 The 5 night Kalahari Safari is on set dates to coincide with the full moon. 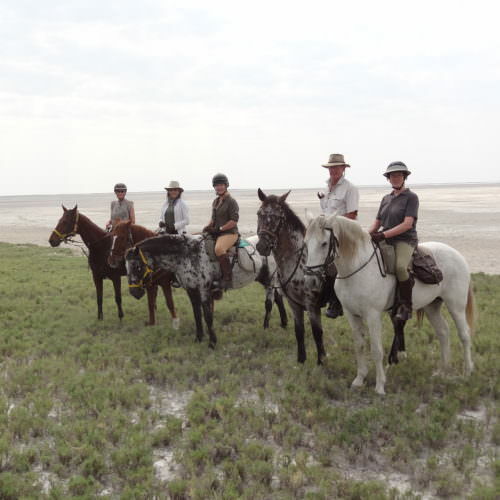 Additional dates may be possible for private groups of four or more. 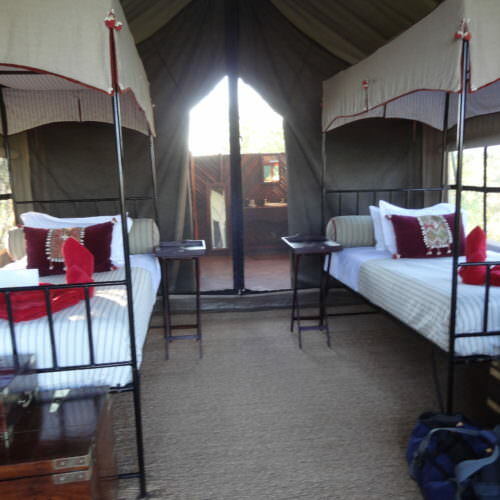 A three night Short Kalahari Ride is available throughout the year for a minimum of four people. 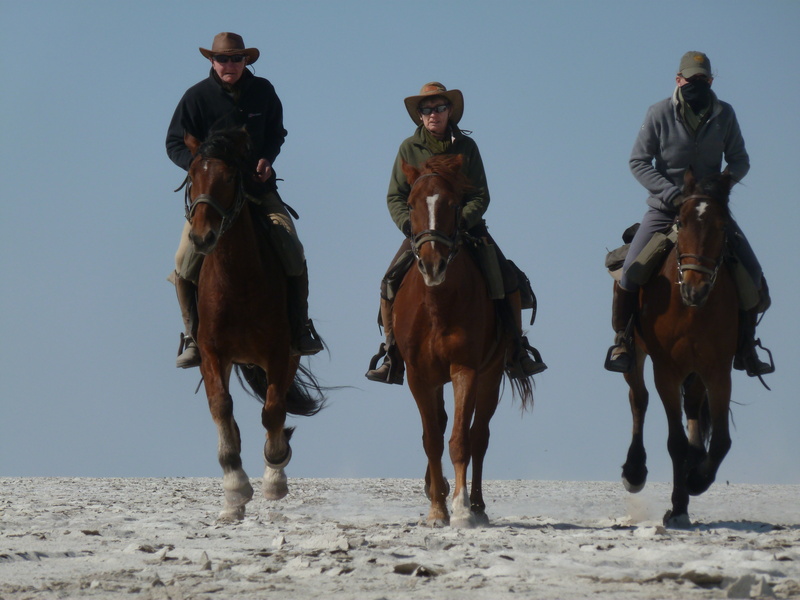 There are two distinctly different seasons. 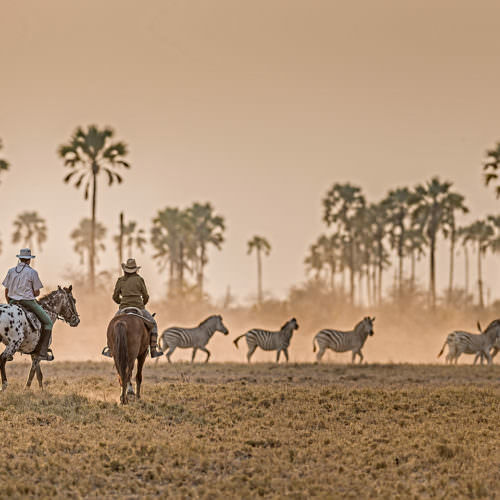 The rains normally arrive in October/November and this is the start of the wet season when the pans fill with water and the grass flourishes. 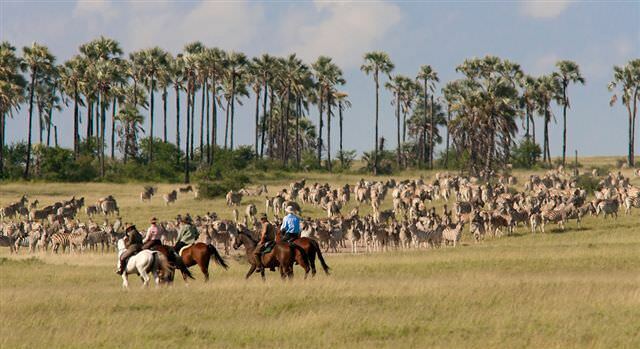 This time also brings the migration of zebra and wildebeest followed by their predators, namely lion. 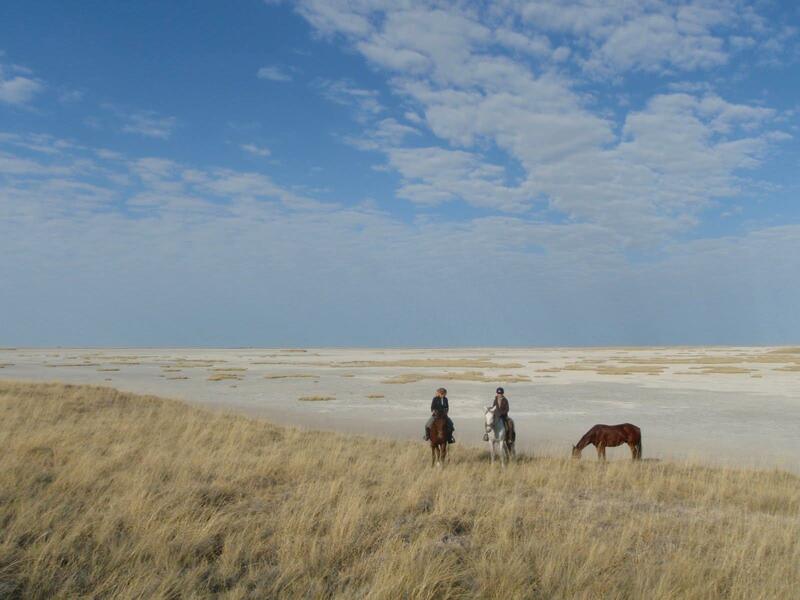 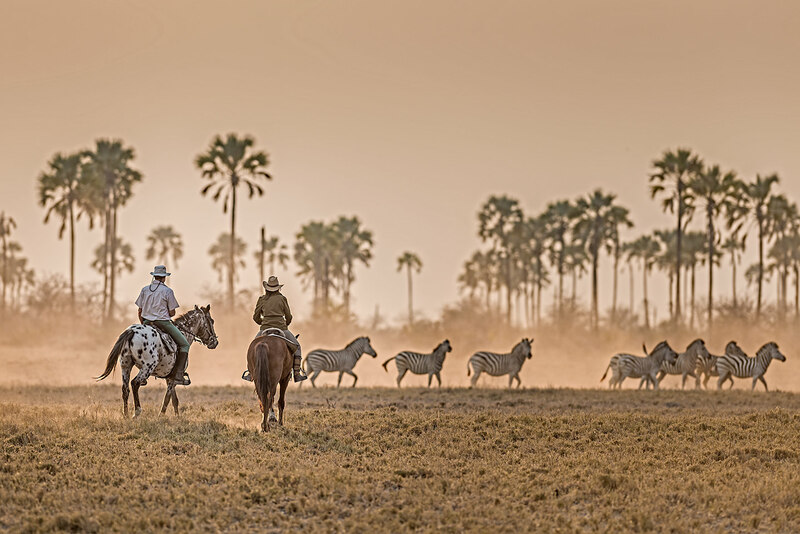 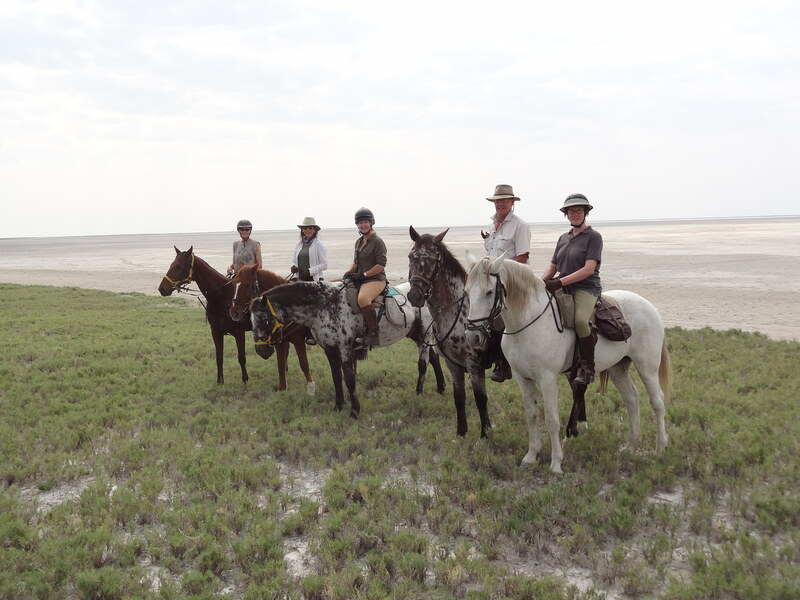 During the wet season it isn't possible to ride on the pans themselves as the water makes the ground sticky and boggy but there are plenty of opportunities for long canters across the grasslands. 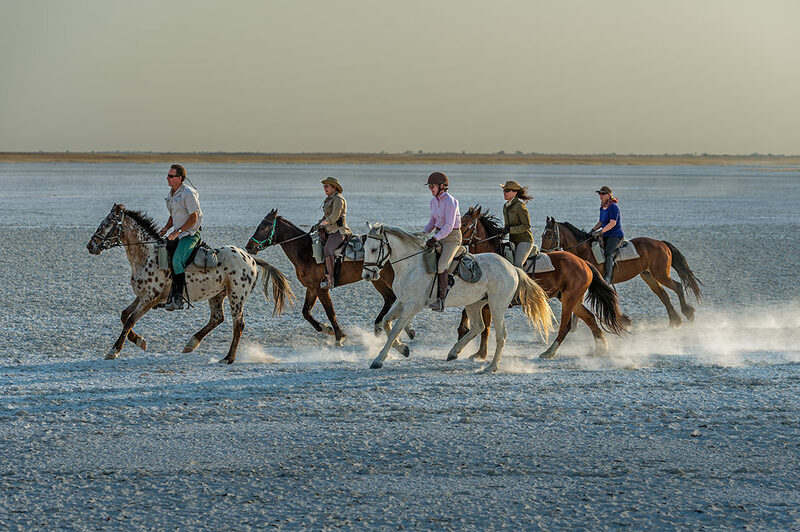 During the dry season (around May - September) there are less zebra and wildebeest, but as the pans dry out there are fantastic opportunities for fast riding across the expanses of salt crust. 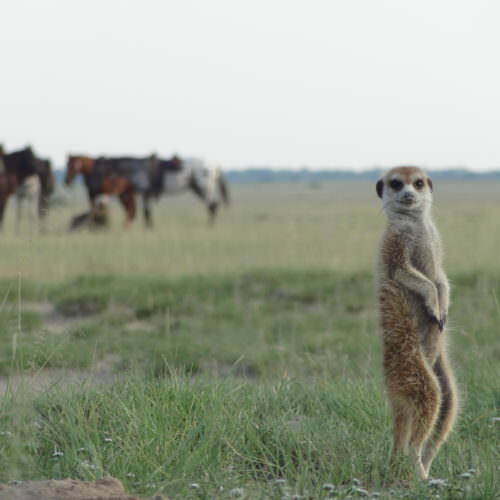 SINGLE SUPPLEMENT The single supplement will be £1,164.62 (£1,303.06 in August). 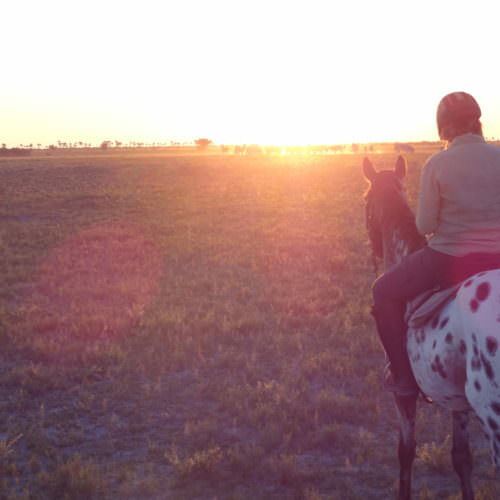 There is no single supplement payable if you are willing to share between January and April. 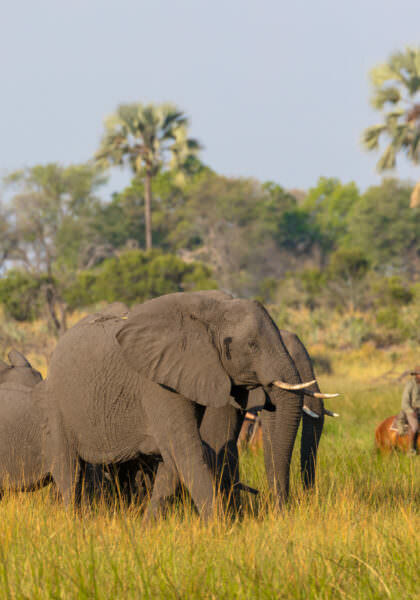 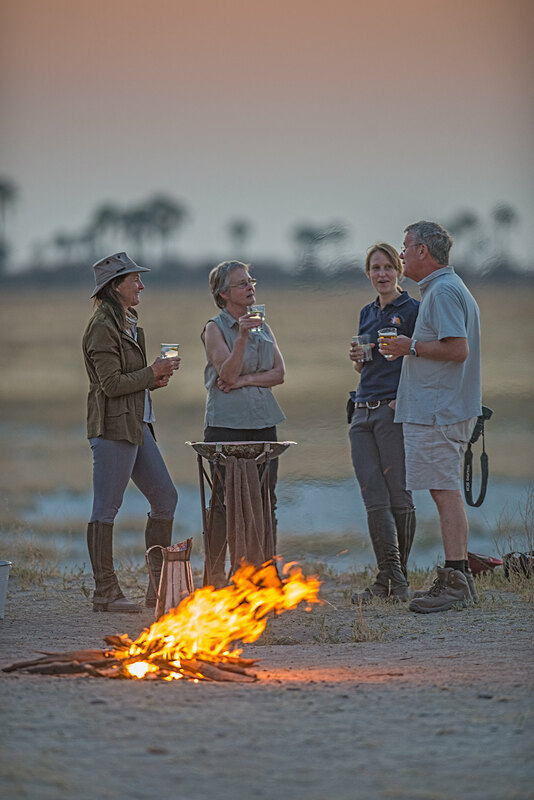 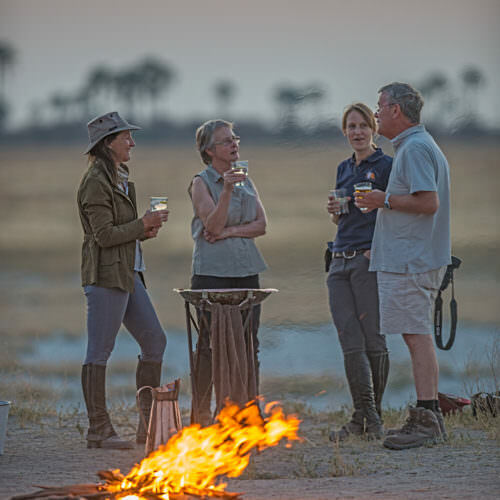 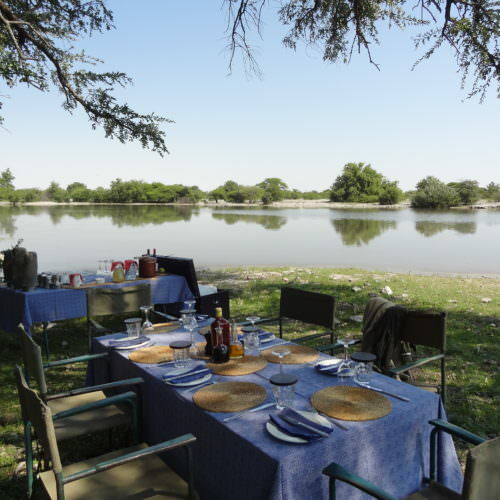 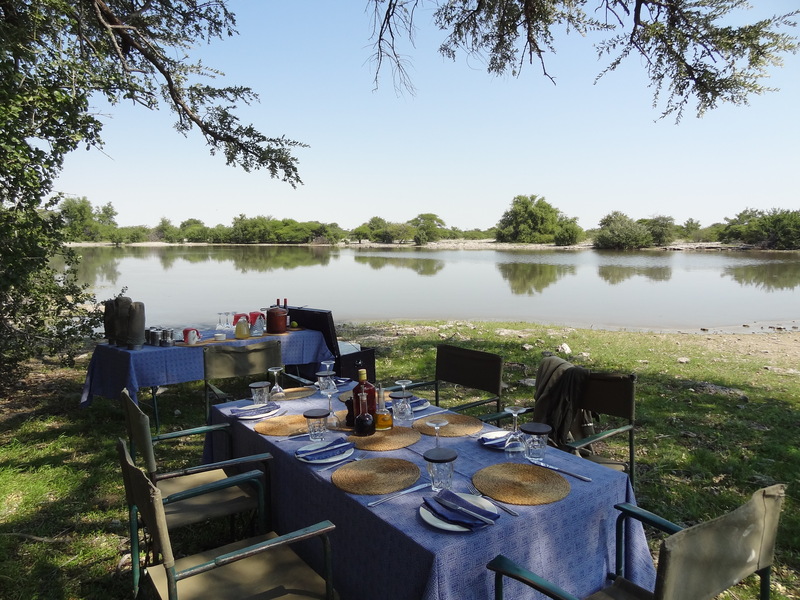 TRANSFERS Shared air transfers from Maun to camp are £282.36 per person each way (min 2). 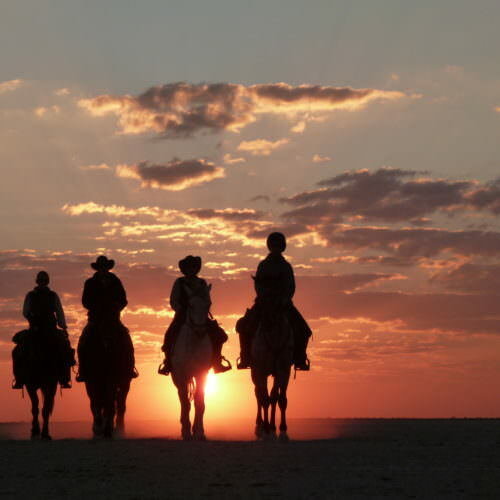 If there is no-one else on the flight there is an additional solo traveller surcharge of £183.81 each way. 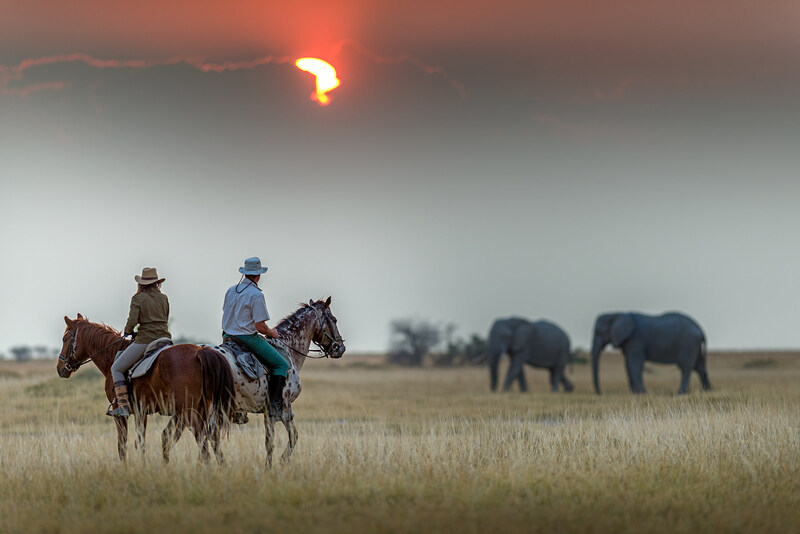 South east of the Okavango Delta and north east of the central Kalahari. 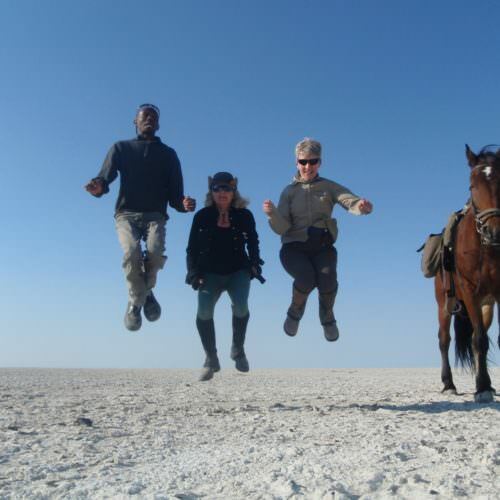 Nearest airport is Maun. 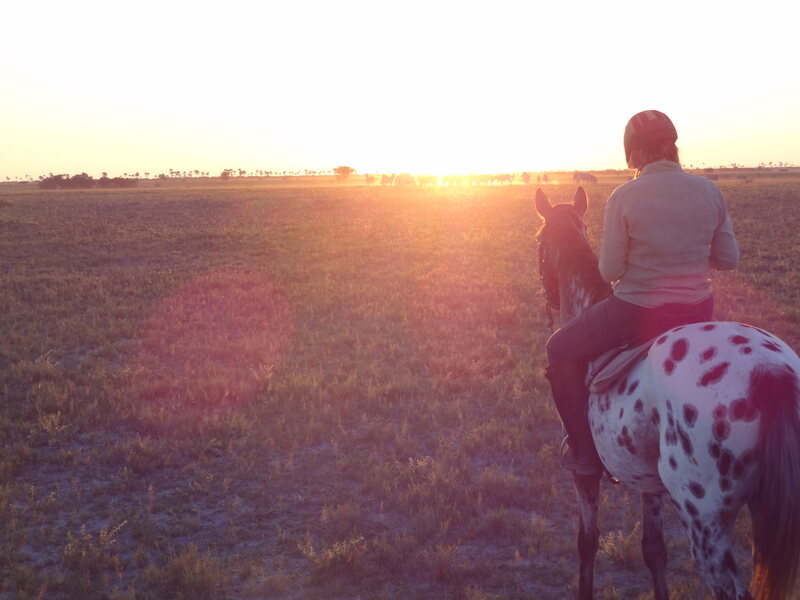 October - March will be hot with the chance of rain to cool things down. 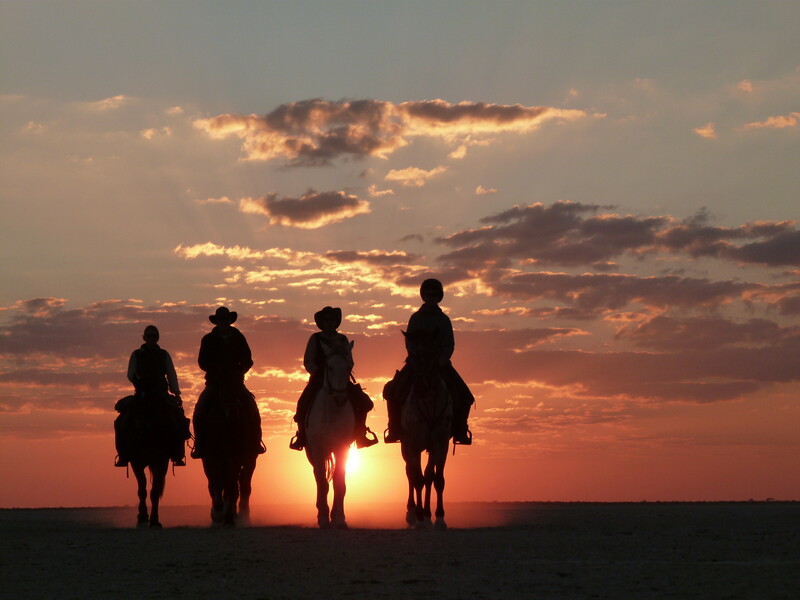 April - September will be warm during the day but could be cold at night - rain is unlikely at this time. 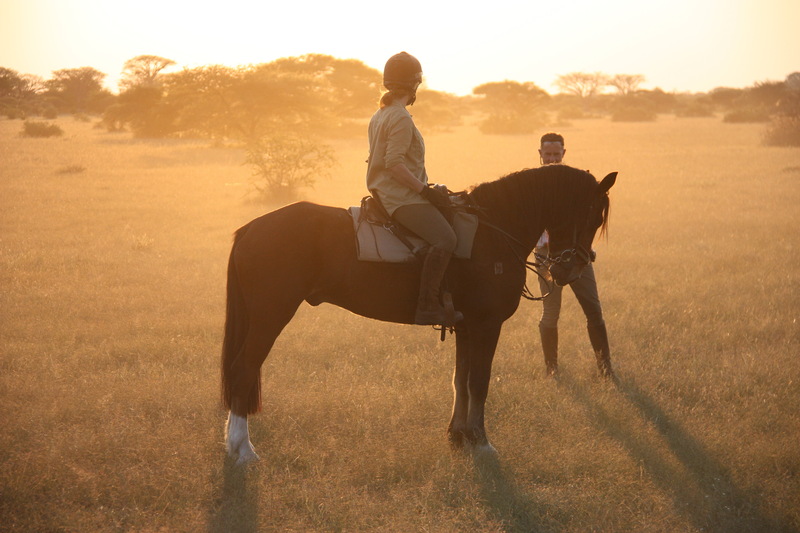 The riding was fabulous and this is a little gem of a ride. 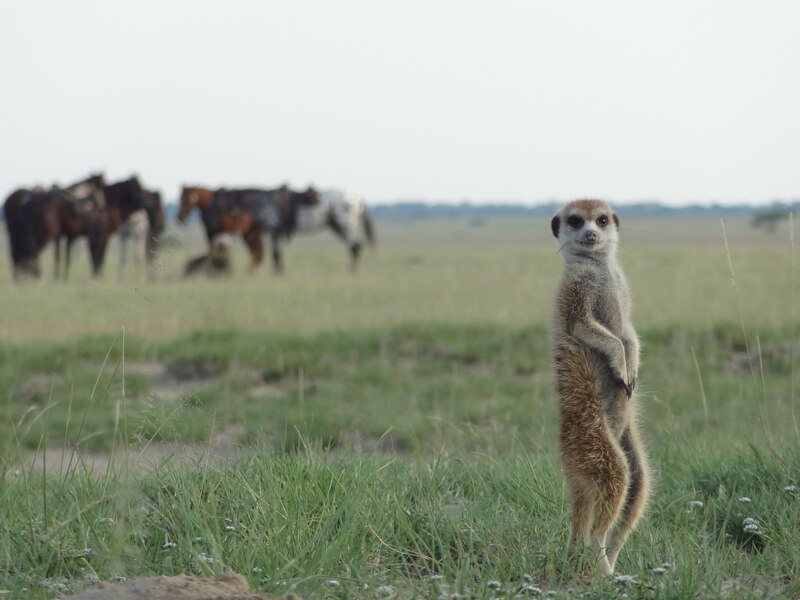 The Kalahari makes you feel very small in the grand scheme of things as everything around you is larger than life and endless. 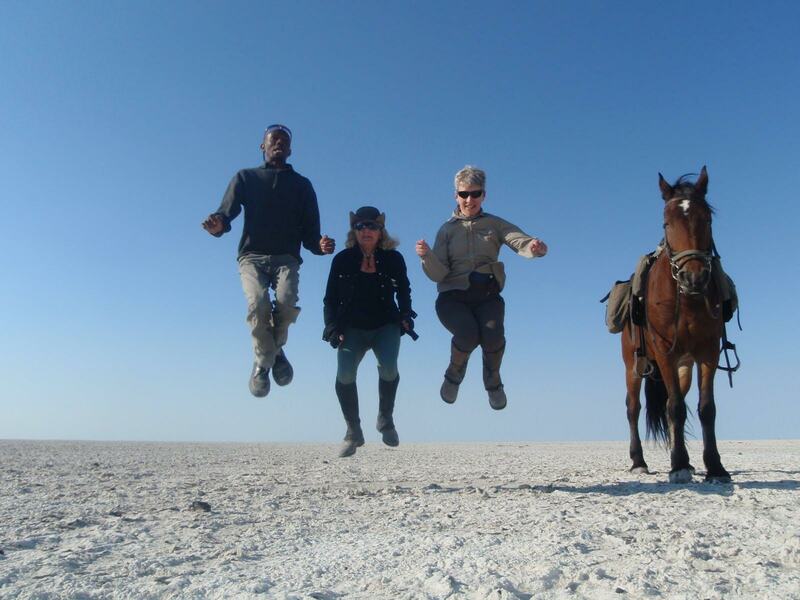 The Makgadikadi Pans stretch out in front of you into infinity, and you would think you were on the surface of the moon except for the scorching desert heat. 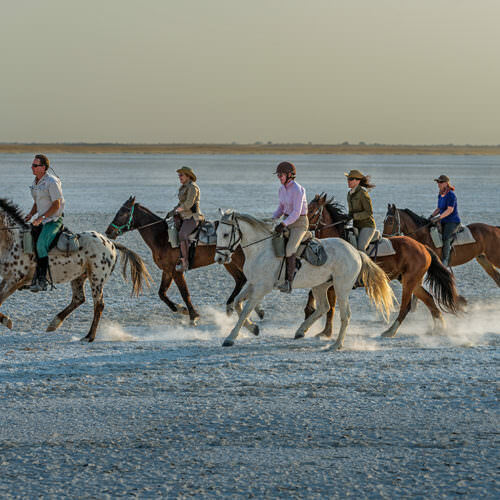 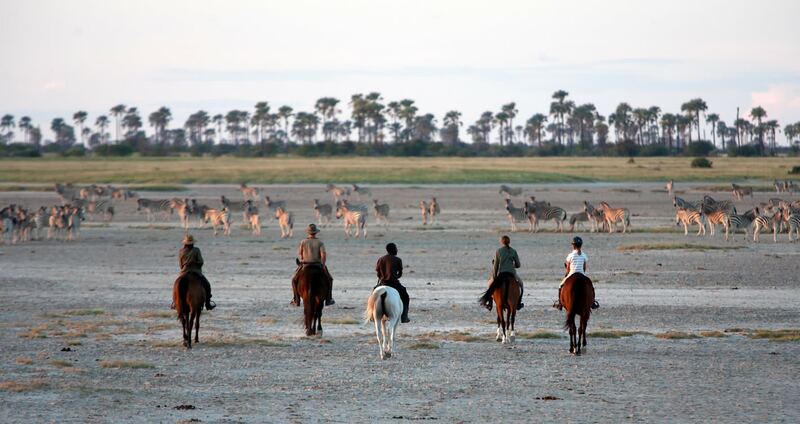 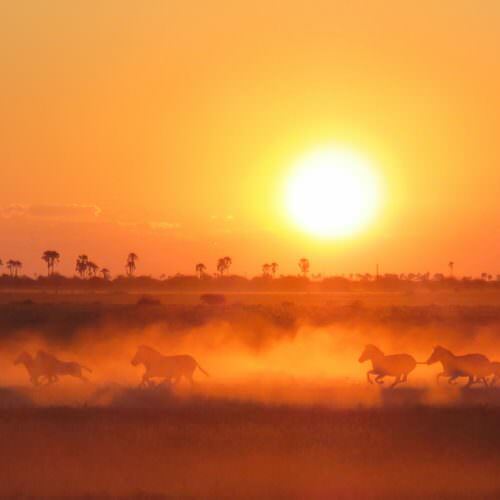 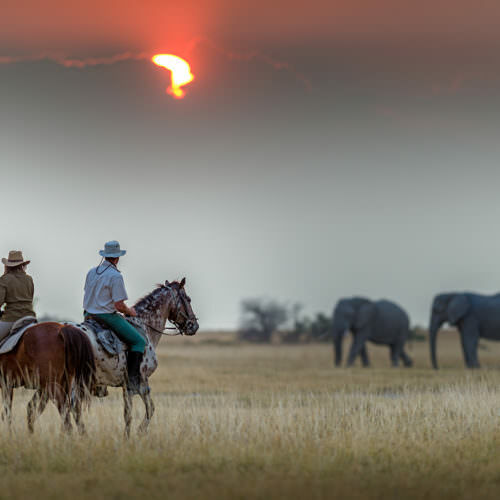 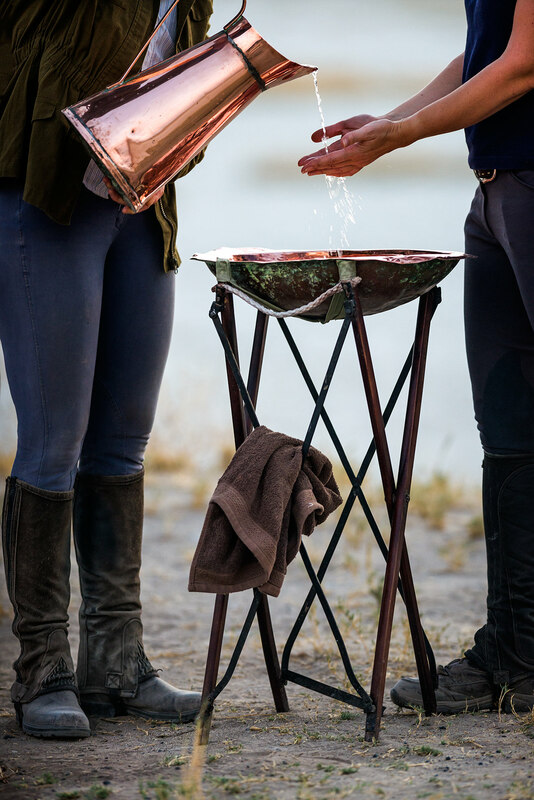 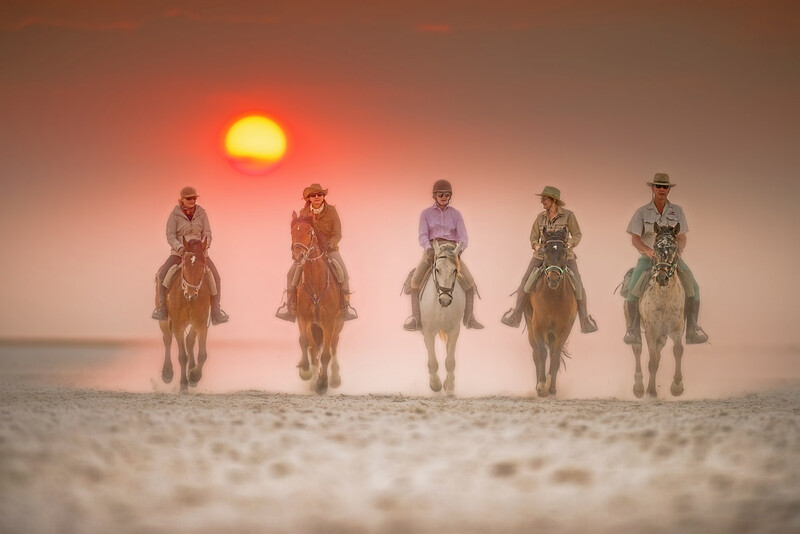 Cantering across the surreal landscape of the salt pans (especially by moonlight) provides the perfect contrast to a horseback safari in the nearby Okavango Delta. 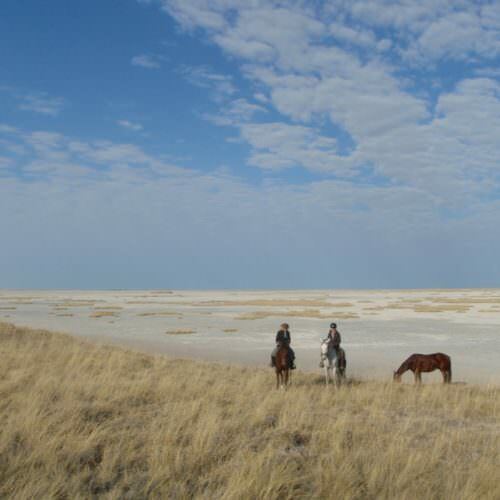 A unique environment that is surprisingly breathtaking! 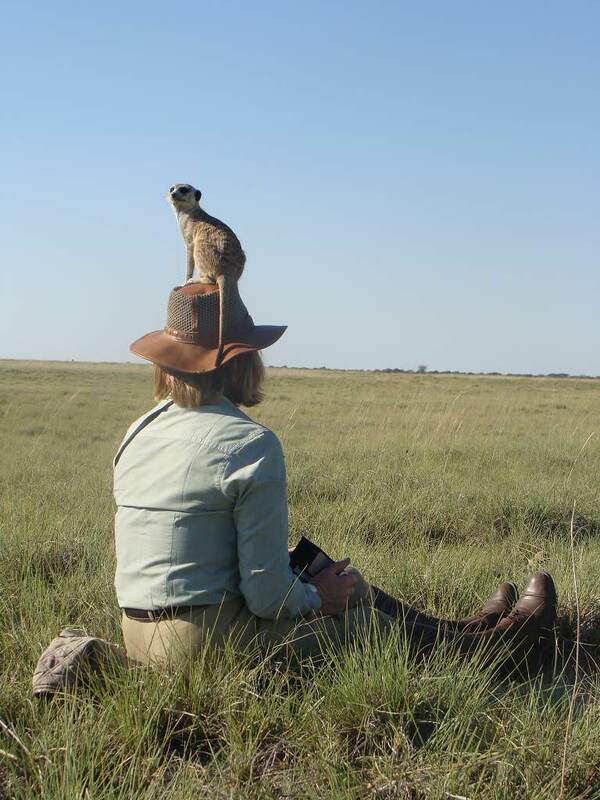 Meeting the meerkats is an experience you will never forget. 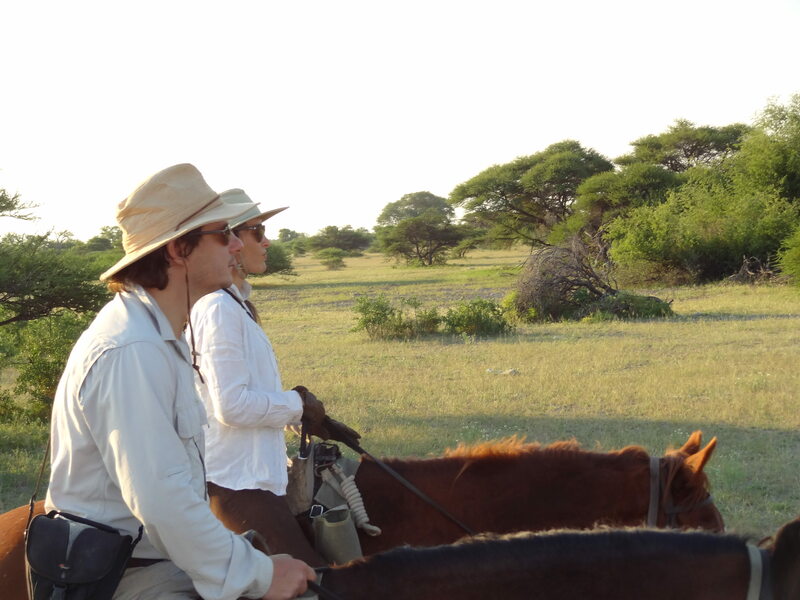 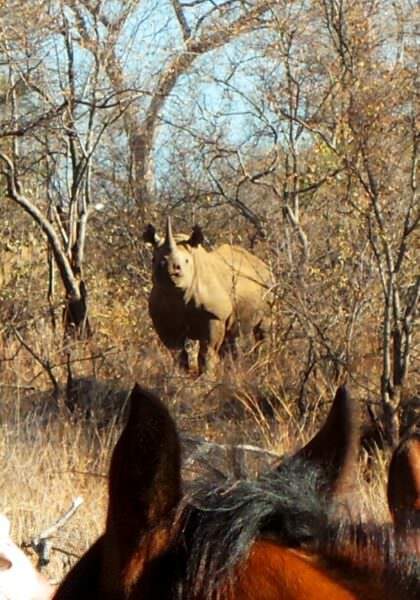 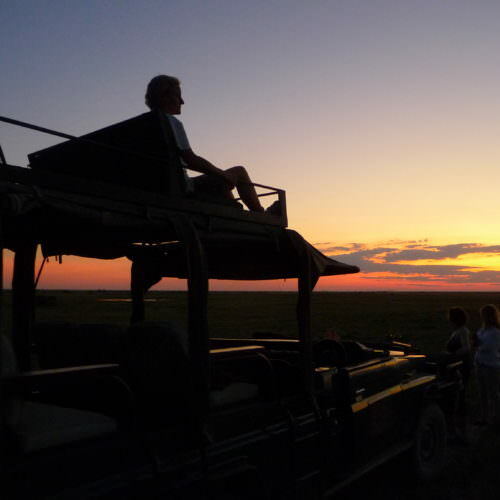 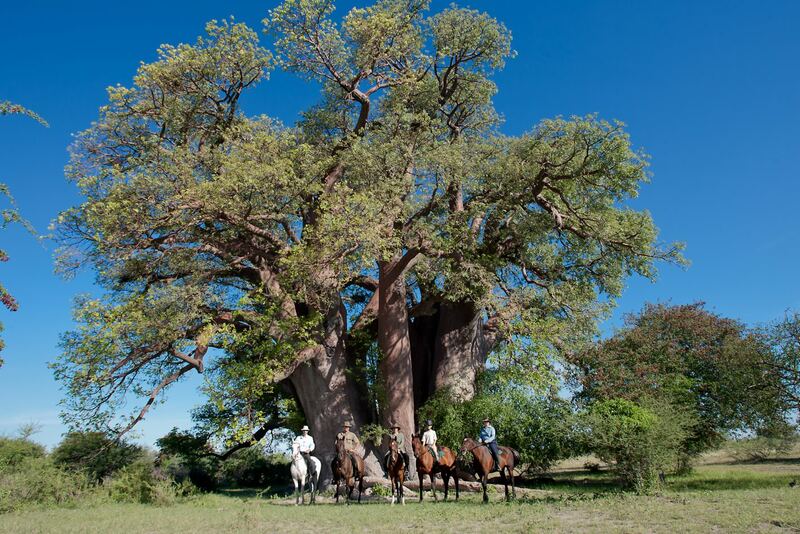 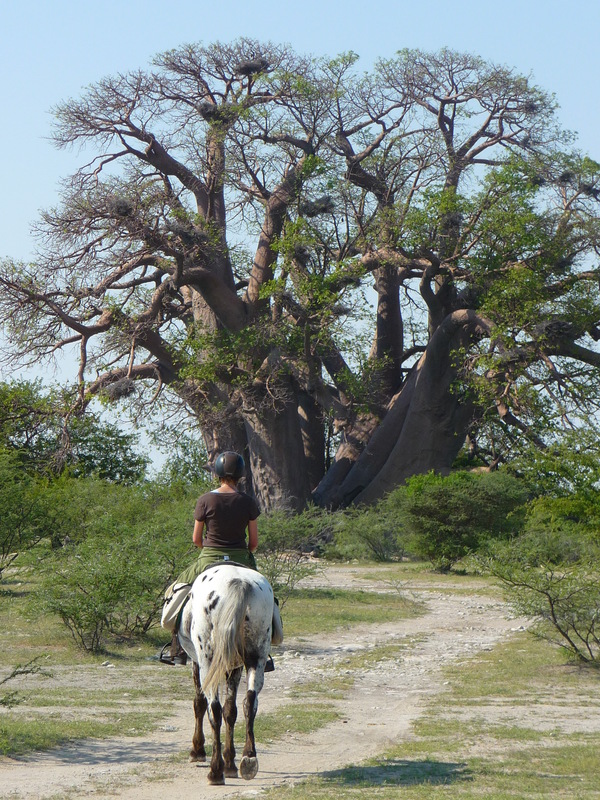 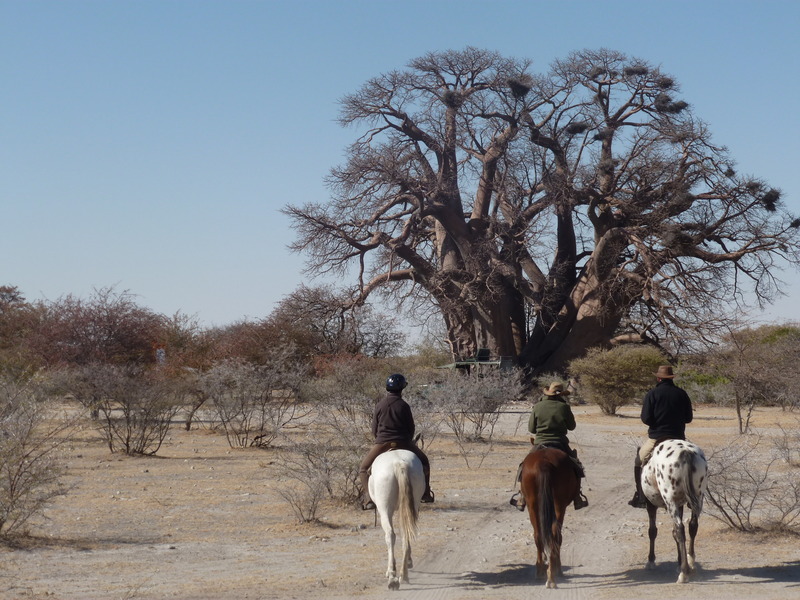 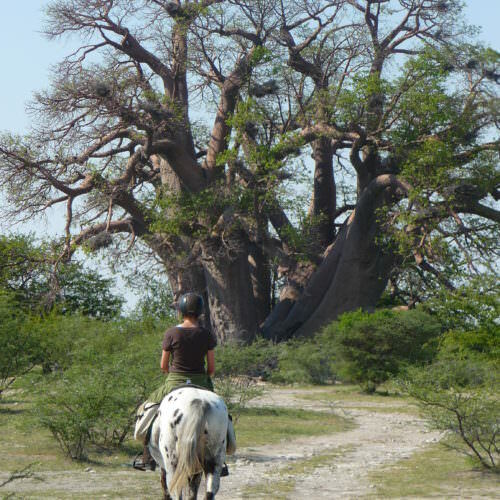 For a longer holiday why not combine this ride with Davids mobile safari in the Okavango Delta. 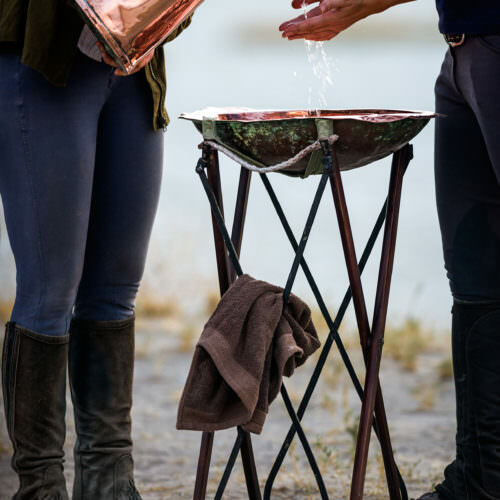 The two together will compliment each other perfectly.